The assassination of Benazir Bhutto is a severe, and potentially crippling, blow to international hopes that Pakistan might emerge into a state of stability. The risks of Pakistan imploding have once again increased. It is a further setback for the US "war on terror", which has as part of its strategy in the region the restoration of democracy in Pakistan to offer an alternative path, away from militancy and extremism. The strategy is very much at risk. 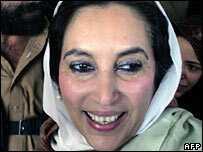 Benazir Bhutto's death came less than two weeks before elections scheduled for 8 January. Her decision to carry on with campaigning despite a double suicide bomb attack on her convoy immediately after her return to Pakistan on 18 October was undoubtedly brave. However, it underestimated the determination of those out to kill her. She herself blamed Islamic extremists for the first attack. The ability of such militants to wreak havoc with their ruthless tactics is once again demonstrated. Up to this point, planning for a more stable nation was more or less on target. President Pervez Musharraf had allowed both Benazir Bhutto and another former prime minister, Nawaz Sharif to return, had stepped down as head of the army and had been re-packaged as a civilian president. He had set a date for parliamentary elections and had lifted the state of emergency. The hope was that politics would be resumed and that the confrontation between the army and Islamic militants would gradually be wound down. An end to such conflict is vital not only for the future stability of Pakistan but for the future of Afghanistan. It is from Pakistan that the Taleban are able to conduct their war against the Afghan government and its Nato supporters. If President Musharraf and the Pakistan army decide that such an approach is no longer possible, they might abandon it and the army might impose military rule, as has happened so often before in Pakistan's national life. Not that Ms Bhutto was seen as the panacea for Pakistan's woes. When in office she was regarded by some as a domineering and at times a divisive figure. But she did offer charismatic leadership at this crucial stage and she had the potential to provide Pakistan with the means of changing its ways.